Prelude to the 6 th massive extinction! Blobs of jellyfish hit Spain beaches:by millions! 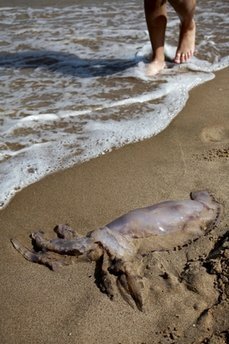 MADRID (AP) – A vast flotilla of small, virtually undetectable jellyfish have stung hundreds of people on Spanish beaches this week — a swimmer’s nightmare that biologists say will become increasingly common due to climate change and overfishing. The blobs attacked three areas near the eastern city of Elche along a famed stretch of white sand beaches known as the Costa Blanca. On Tuesday alone, 380 people were stung, compared to the usual four or five swimmers a day, said Juan Carlos Castellanos of the Elche city tourism department. There was no sign of the jellyfish on Wednesday, but since Sunday at least 700 people have been stung. “In the five or six years I have been in this job, I have never seen anything like this,” Castellanos said. The beaches were never closed but officials put up warning signs and stationed lookout boats offshore. The tourism official blamed strong currents for sweeping the jellyfish onto the beaches and then calm seas for letting them hang around for three days. Particularly warm waters — which jellyfish like — also helped boost their numbers during Spain’s key summer tourism season. One problem was these jellyfish were small and almost transparent were not readily visible and thinly spread out over five kilometers (3 miles) of coastline. Far to the north, a much more menacing species looms — the Portuguese Man-of-War, a floating, violet-colored sack with meters-long tentacles. They have stung more than 300 people over the past three weeks in Atlantic waters off Spain’s northern coasts of Cantabria and the Basque region, officials said. Spanish marine biologists say, in general, they are seeing fewer jellyfish this summer than in other years. In the Catalonia region and the Balearic islands — both hugely popular with British and German tourists — officials said this summer has been relatively quiet on the jellyfish front. Very good explications about this phenomena!